Thought to be the world’s oldest desert, the Namib Desert of southwest Africa is home to the ecological preserve known as Namib-Naukluft National Park. The park originated in 1907 as a parcel of land between the Kuiseb and Swakop Rivers. Rapid expansion began in 1941 with the incorporation of the Sandwich Harbor. This was followed by the additions of the Kuiseb Canyon, the Swakop River Valley, Welwitschia Plains, Sesriem, and Sossusvlei. In 1972, the park officially joined the Naukluft Park, and the Namib-Naukluft National Park was created. There is evidence to suggest dramatic erosion and advancing of the Namibian coastline. For example, in 1909 the Eduard Bohlen, a passenger liner weighing 2,272 tons, wrecked and crashed ashore. It is now beached 1214 feet inland from the coast. It is highly improbable that storms alone could carry the wreck that far. The contention is that the coastlines changes played a pivotal role. “I first became aware of the fact that the Namibian coastline had changed after a trip through the dunes and along the coast near Conception Bay. After the trip I plotted up the track we had taken on a Landsat image made in 2000 and discovered that in certain areas my vehicle track went fairly far out to sea… not an amphibious vehicle either! ),” reflects Dr. Roger Swart of NAMCOR (Namibian Petroleum Corporation). Multiple changes are also occurring on the coastal spits along the Namib Desert coast. Spits are long, elongated sand bodies that reach out from the coast at different spots.Spits extend in the direction of the prevailing current, which is south to north in Namibia. The driving force is the southwesterly wind and the Benguela Current. The spits at Walvis Bay and Sandwich Harbor are the best known in Namibia. This accretion can be recognized on satellite images as low ridges of sand that bend towards the land in a northeasterly direction. The spits are ever changing due to sediment that constantly shifts around by the waves and currents. 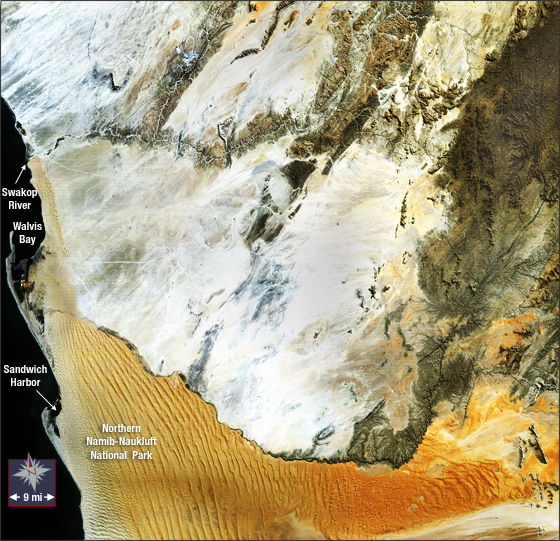 The majestic saffron-colored dunes of the park can be seen in the lower portion of the natural color Landsat 5 image shown here (acquired on May 26, 1992). Along the left edge of the image, the famous spits are visible.